My repertoire stretches over 800 years and I particularly enjoy very old and very new music. That said, the bulk of my work focuses on the Baroque from around 1620 to 1750 and the mid 20th century onwards. I have over 100 works in my repertoire from the 17th and 18th century, including sonatas, trio sonatas, sets of divisions, arias and orchestral works. I especially enjoy the freedom this music brings me as a performer, the exhilaration of knowing that every performance is unique and the mix of great serenity and refinement with daring virtuosity. Much recorder music goes off the beaten track. I have a passion for introducing audiences to new or unfamiliar music, or indeed unfamiliar works for recorder by well-known composers. Among these I would count among my favourites works by York Bowen, Donald Swan, Cyril Scott, Gordon Jacob and Malcolm Arnold. I am particularly proud to have a small number of commissions and dedications and I hope to continue adding to these. The gap roughly between 1750 and 1930, during which the recorder largely fell out of common use, is rather inconvenient for programming purposes. It is my belief that that whilst composers such as Schubert, Shostakovich, Rachmaninov and Debussy may have missed out, the recorder doesn’t have to … I regularly include transcriptions of works whose composers had the misfortune to be active at a time when the recorder was not. My programmes page contains a few sample programmes. I perform everything from memory. This means that for a piece to be in my repertoire, it has been dissected, studied forensically, re-assembled and played ad just short of nauseam. 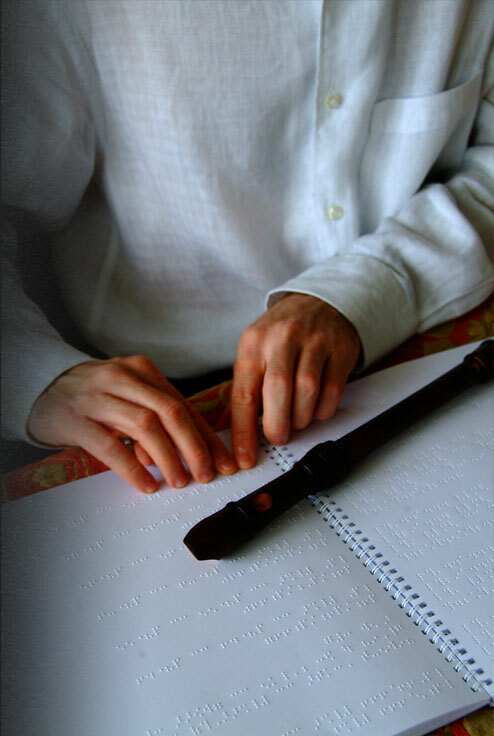 Every score has passed through either a human being or a piece of software to be turned into Braille music. Some contemporary works for recorder have proved to be at the very edge of what can be meaningfully rendered in combinations of six dots – and what my musical brain can process. For this reason, showcases of some of the more experimental and conceptual recorder repertoire do not feature large in my work. That said, my “bucket list” is far from complete and there are several pieces at various stages along this process in preparation for performance – watch this space!